The condition pityriasis versicolor was first identified in 1846. Versicolor comes from the Latin, from versāre to turn + color. It is also commonly referred to as Peter Elam's disease in many parts of South Asia. Pityriasis versicolor in a 27-year-old man and electron micrograph of his skin showing round Malassezia spores (S). Pale, dark tan, or pink in color, with a reddish undertone that can darken when the patient is overheated, such as in a hot shower or during/after exercise. Tanning typically makes the affected areas contrast more starkly with the surrounding skin. The yeasts can often be seen under the microscope within the lesions and typically have a so-called "spaghetti and meatball appearance" as the round yeasts produce filaments. 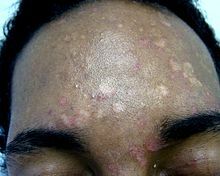 In people with dark skin tones, pigmentary changes such as hypopigmentation (loss of color) are common, while in those with lighter skin color, hyperpigmentation (increase in skin color) is more common. These discolorations have led to the term "sun fungus". In cases of tinea versicolor caused by the fungus Malassezia furfur, lightening of the skin occurs due to the fungus's production of azelaic acid, which has a slight bleaching effect. Topical antifungal medications containing selenium sulfide are often recommended. Ketoconazole (Nizoral ointment and shampoo) is another treatment. It is normally applied to dry skin and washed off after 10 minutes, repeated daily for two weeks. Ciclopirox (Ciclopirox olamine) is an alternative treatment to ketoconazole, as it suppresses growth of the yeast Malassezia furfur. Initial results show similar efficacy to ketoconazole with a relative increase in subjective symptom relief due to its inherent anti-inflammatory properties. Other topical antifungal agents such as clotrimazole, miconazole, terbinafine, or zinc pyrithione can lessen symptoms in some patients. Additionally, hydrogen peroxide has been known to lessen symptoms and, on certain occasions, remove the problem, although permanent scarring has occurred with this treatment in some sufferers. Clotrimazole is also used combined with selenium sulfide. This skin disease commonly affects adolescents and young adults, especially in warm and humid climates. The yeast is thought to feed on skin oils (lipids), as well as dead skin cells. Infections are more common in people who have seborrheic dermatitis, dandruff, and hyperhidrosis. ^ a b c d Rapini, Ronald P; Bolognia, Jean L.; Jorizzo, Joseph L (2007). Dermatology: 2-Volume Set. St Louis: Mosby. pp. Chapter 76. ISBN 1-4160-2999-0. ^ a b Morishita N; Sei Y. (December 2006). "Microreview of pityriasis versicolor and Malassezia species". Mycopathologia. 162 (6): 373–76. doi:10.1007/s11046-006-0081-2. ^ Prohic A; Ozegovic L. (January 2007). "Malassezia species isolated from lesional and non-lesional skin in patients with pityriasis versicolor". Mycoses. 50 (1): 58–63. doi:10.1111/j.1439-0507.2006.01310.x. PMID 17302750. ^ a b Weedon, D. (2002). Skin pathology (2nd ed.). Churchill Livingstone. ISBN 0-443-07069-5. ^ Inamadar AC, Palit A (2003). "The genus Malassezia and human disease". Indian J Dermatol Venereol Leprol. 69 (4): 265–70. PMID 17642908. ^ "versicolor". Collins English Dictionary — Complete & Unabridged 10th Edition. HarperCollins Publishers. Retrieved March 2, 2013. ^ Kaushik A, Pinto HP, Bhat RM, Sukumar D, Srinath MK (2014). "A study of the prevalence and precipitating factors of pruritus in pityriasis versicolor". Indian Dermatology Online Journal. 5 (2): 223–224. doi:10.4103/2229-5178.131141. PMC 4030364. PMID 24860771. ^ "What to Avoid While Treating Tinea Versicolor". Archived from the original on 2013-07-27. Retrieved 2013-01-05. ^ a b Pityriasis versicolor | DermNet New Zealand. Dermnetnz.org. Retrieved on 2016-10-14. ^ "Adolescent Health Curriculum - Medical Problems - Dermatology - Papulosquamous Lesions (B4)". Retrieved 2008-12-10. ^ "Tioconazole (Topical Route) - MayoClinic.com". Retrieved 2008-12-10. ^ Vary JC Jr (November 2015). "Selected Disorders of Skin Appendages-Acne, Alopecia, Hyperhidrosis". The Medical Clinics of North America. 99 (6): 1195–1211. doi:10.1016/j.mcna.2015.07.003. PMID 26476248. ^ Ratnavel RC, Squire RA, Boorman GC (2007). "Clinical efficacies of shampoos containing ciclopirox olamine (1.5%) and ketoconazole (2.0%) in the treatment of seborrhoeic dermatitis". J Dermatolog Treat. 18 (2): 88–96. doi:10.1080/16537150601092944. PMID 17520465. ^ Faergemann, Jan (2000). "Management of Seborrheic Dermatitis and Pityriasis Versicolor". Am. J. Clin. Dermatol. 1 (2): 75–80. doi:10.2165/00128071-200001020-00001. PMID 11702314. ^ Faergemann J, Gupta AK, Al Mofadi A, Abanami A, Shareaah AA, Marynissen G (January 2002). "Efficacy of itraconazole in the prophylactic treatment of pityriasis (tinea) versicolor". Arch Dermatol. 138 (1): 69–73. doi:10.1001/archderm.138.1.69. PMID 11790169. ^ Mohanty J, Sethi J, Sharma MK (2001). "Efficacy of itraconazole in the treatment of tinea versicolor". Indian J Dermatol Venereol Leprol. 67 (5): 240–1. PMID 17664760. ^ Ketoconazole. Fpnotebook.com. Retrieved on 2016-10-14. This page was last edited on 2 July 2018, at 15:18 (UTC).